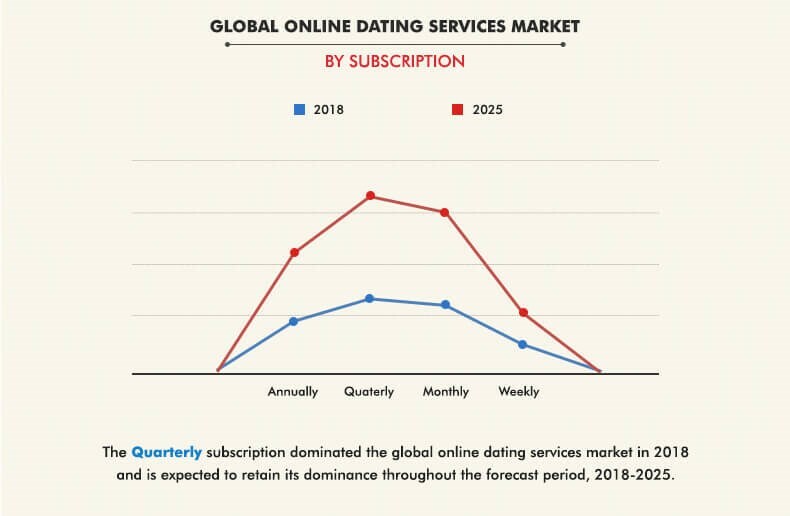 The global online dating services market was valued at $6,400.0 million in 2017, and is projected to reach $9,202 million by 2025, growing at a CAGR of 4.7% from 2018 to 2025. The dating service industry has exhibited strong growth in terms of sales, and has been evolving continuously over the past couple of decades. This is attributable to rise in number of singles around the globe, especially in North America, Europe, and Asia-Pacific. Surge in internet penetration around the globe has resulted in significant growth of the online dating services market. This has given immense opportunity for service providers to gain traction among their target customers by coming up with customized features that cater to the needs of customers. Millennials are specific and conscious to find their significant other, taking into account of the second persons perception toward life, like-minded perception on various aspects, and other such common like or dislikes. This has boosted dating service providers on innovating their services that match customer expectations. Various online dating services providers are using artificial intelligence to provide guidance or suggestion to their customers on whether to go on a first date with person that they have met online. For instance, recently, eHarmony, one of the key players in online dating services market, announced on developing an AI-enabled feature that nudges users to suggest meeting in person after they have been chatting in the app for a while. Moreover, these dating apps are making significant use of new technologies into their services. For example, in 2018, Badoo, one of the key players in the online dating services market, announced the addition of live video chat feature to its apps that gives its user a chance to talk face-to-face. Hence, adoption of technology is one of the most influential trends in the online dating services market growth. As per sources, 41% of singles have used online dating apps or sites at least once in their life. Among these singles, nearly 68% of them are males. Based on services, the online dating services market is segmented into matchmaking, social dating, adult dating, and niche dating. Among these services, the social dating services segment accounts for a higher share. This is attributed to the fact that social dating is specifically designed for millennials, where one looks for instant hookups or similar kind of nonmonogamous relationships. Like other services, social dating has two different types of business models such as the free subscription and paid subscription. Rise in internet penetration in the major parts of the globe has led to increased usage of smartphones. This factor provides immense opportunity for dating service players to develop apps that are convenient to use on smartphones. Several global brands are gaining traction in regions such as North America, Europe, and Asia-Pacific. Among these, North America garners the major share in the global social dating segment. Tinder and OKCupid are some of the most downloaded apps among the millennials. Depending on subscription, the online dating services market share is categorized into annually, quarterly, monthly, and weekly. 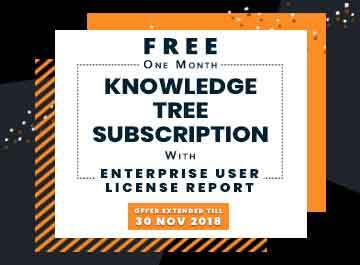 Among these subscription plans, maximum customers prefer quarterly subscription. This has encouraged key players in the online dating services market to come up with lucrative offers for this plan to increase the subscription rate. For instance, Tinder and eHarmony provide remunerative offers to customer opting for quarterly subscription after more than one iteration. By demography, the online dating services market size is segregated into adult and baby boomers. The millennial population aged between 18 and 35 years are active on various online dating sites. Some of the key players in the online dating services market generate their revenue annually through this portion of the population. Among millennials, more than 30% of the population has revealed that they did find their life partner through online dating sites. Moreover, certain millennials who prefer nonmonogamous relationships over long-term commitments, social dating sites such Tinder and OKCupid serve as ideal platforms. 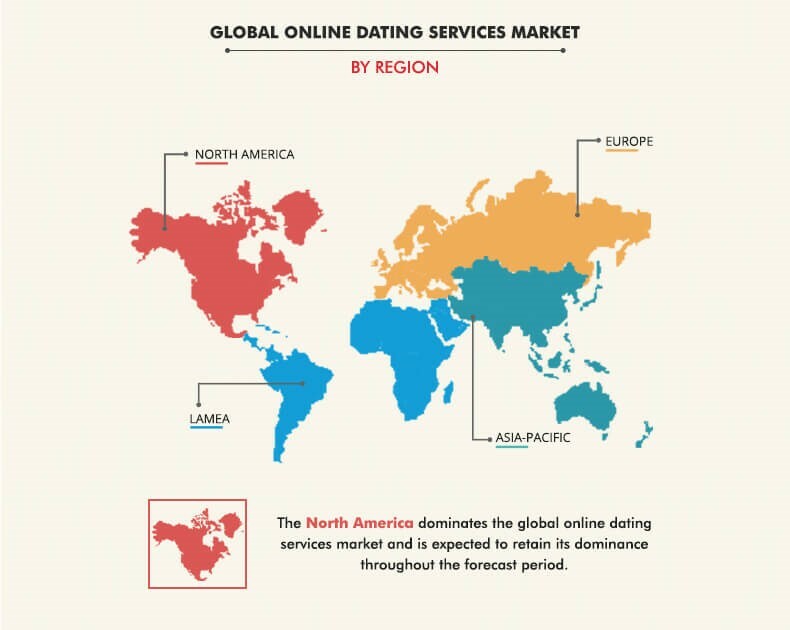 Region wise, the online dating services market analysis is initiated across North America, Europe, Asia-Pacific, and LAMEA. North America is being considered as the matured market for online dating services industry. This is attributed to the fact that the U.S. population accounts for higher number of singles, which turns out be the customer base for various online dating services providers. Moreover, the region has higher rate of internet penetration with 80% of the service sector going online for the sake of convenience and time value. As per 2016 stats, around 44 million users stay active on various online dating services apps and sites in North American. 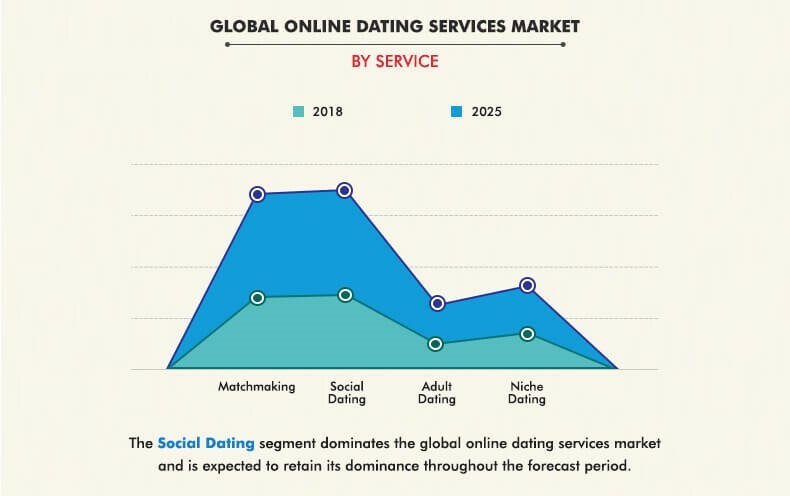 The key players profiled in the online dating services market includes Badoo, eharmony, Inc., Grindr LLC, Love Group Global Ltd., Match Group, Inc., Spark Networks SE, The Meet Group Inc., Spice of Life, Zoosk Inc., and rsvp.com.au Pty Ltd. 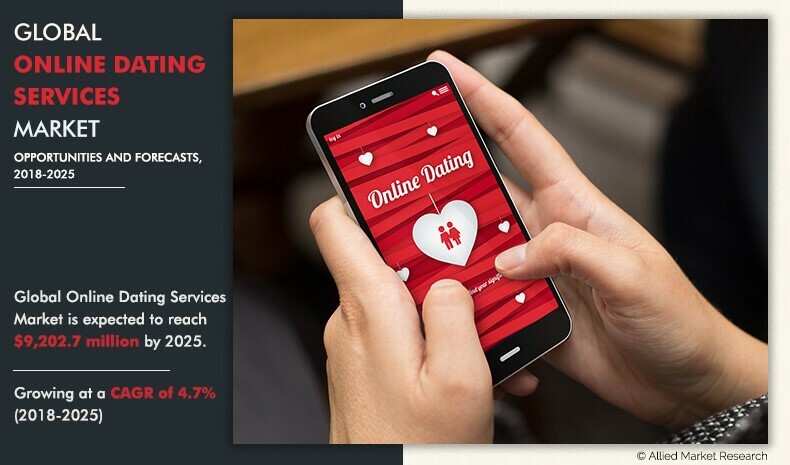 The report provides detailed qualitative and quantitative analysis of the current online dating services market trends and future estimations that help evaluate the prevailing market opportunities. 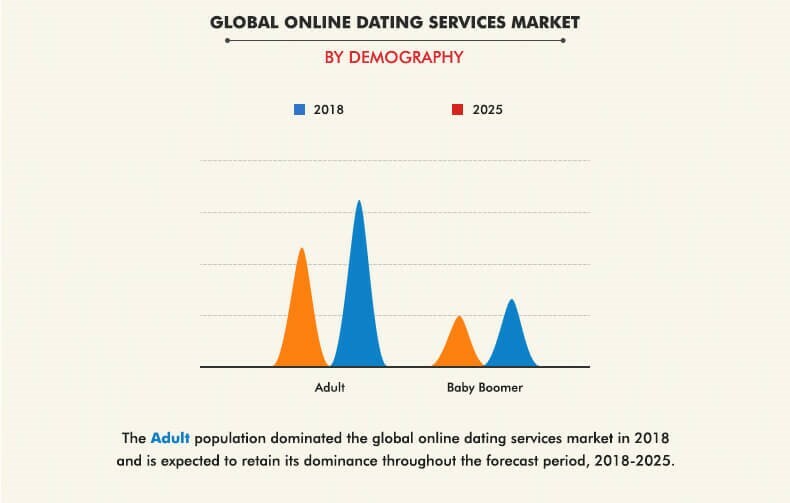 A comprehensive analysis of the factors that drive and restrict the growth of the online dating services market is provided. The report provides extensive qualitative insights on the potential segments or regions exhibiting favorable growth. 8.9. The Meet Group, Inc.
Online dating services has been growing at a significant rate in terms of sales value. Upsurge in internet penetration has facilitated easy access to online dating services. Moreover, over the past two decades, the number of singles has been to increase at a considerable rate. Millennials account for a large share of the total single population. This kind of population prefers being in a nonmonogamous relationship rather than being in a long-term relationship. For them, online dating services sights as an ideal platform. Thus, the online dating services market is turning out to be highly competitive. The players in the market strategize on continuous improvement in their services that cater to the varying needs and requirements of their target customers. Most of major players in the market have adopted artificial intelligence technology to facilitate convenient use of their services.